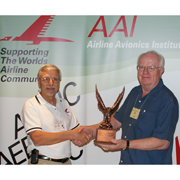 Retired Jeppesen senior vice president receives the Airline Avionics Institute Pioneer Award. Jim Terpstra, retired Jeppesen senior vice president for Aviation Affairs and Flight Information Technology, has been honored by the Airline Avionics Institute for his leadership in advancing flight information technology and aeronautical navigation. Terpstra is only the ninth recipient of AAI’s Pioneer Award, which is designated for those who have made unique and lasting contributions to commercial avionics, and flight simulation. During his career, Terpstra oversaw the development of many technologies which today are common navigational elements or techniques. He played a key role in the introduction of NavData® as a commercial product and, as the aviation industry has become increasingly data dependent, he has worked tirelessly to ensure the availability of data in common, consistent formats. He was a founding member of the group that would become the ARINC 424 Working Group, which sets standards for data formatting. Terpstra also has been a driving force behind the industry shift from paper-based navigational information products, to electronic solutions. He led Jeppesen’s early adoption of computers to compile, draft and maintain aeronautical charts, and later led the development of electronic charts for use, both on the ground and in flight. Terpstra also is a well-known and respected author and speaker. He is widely-known among pilots and others for the Chart Clinic, a series of educational articles he wrote for a leading aviation magazine, as well as for the forums he conducts at major air shows and events, in which he imparts his extensive knowledge about the nuances of charts, databases and the airspace systems pilots use them to fly in. Terpstra is an experienced pilot, holding an Airline Transport Pilot certificate with single- and multi-engine ratings, and has flown more than 6,100 hours. He also is an FAA Gold Seal flight instructor. For more than 75 years Jeppesen has made it possible for pilots and their passengers to safely and efficiently reach their destinations. Today this pioneering spirit continues as Jeppesen delivers essential information and optimization solutions to improve the efficiency of air, sea and rail operations around the globe. Jeppesen is a subsidiary of Boeing Commercial Aviation Services, a unit of Boeing Commercial Airplanes. Jeppesen corporate information is available online at jeppesen.com.